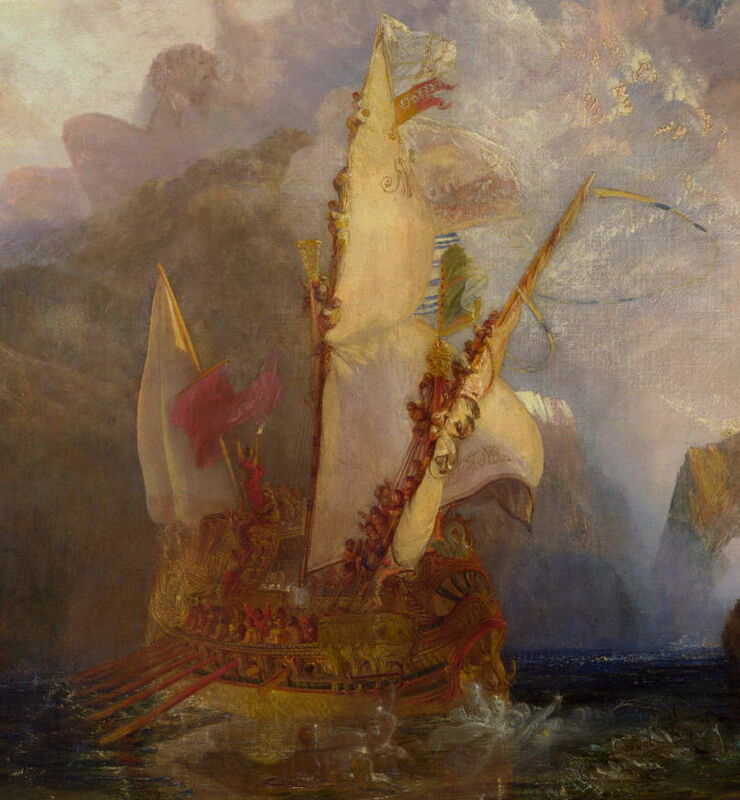 Joseph Mallord William Turner (1775–1851), Ulysses Deriding Polyphemus (detail) (1829), oil on canvas, 132.7 × 203 cm, The National Gallery, London. Wikimedia Commons. 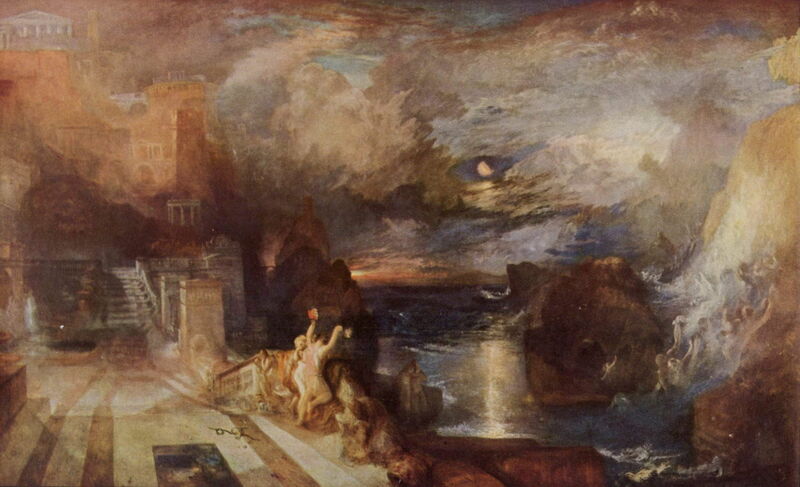 Another major narrative painter of the nineteenth century was JMW Turner (1775-1851). As a young and brilliant student at the Royal Academy Schools in London from around 1789, and despite his long career painting landscapes and topographic views, he was taught that history painting was the queen of the genres – and painted narrative works even to his death in 1851. His contemporary rivals in landscapes, John Constable (1776-1837) and the tragically short-lived Thomas Girtin (1775-1802), appeared unable to match Turner’s versatility in this respect, making Turner the last – and arguably the greatest – major British artist who was a prolific classical narrative painter. Ulysses is the Latin name for Odysseus, hero of Homer’s Odyssey, and the central character in this narrative. During his eventful and epic journey home from the Trojan War, as detailed in the Odyssey, Ulysses came across the Cyclops, in particular Polyphemus, a savage one-eyed man-eating giant who spent his days tending his flock of sheep. After Polyphemus has devoured several of Ulysses’ crew, Ulysses gets Polyphemus drunk. Polyphemus asks Ulysses his name, and the latter replies Οὖτις (Outis, Greek for nobody). Once the giant has fallen into a stupor, Ulysses drives a hardened stake into the Cyclops’ one eye, and blinds him. The following morning, Ulysses and his men tie themselves to the undersides of the sheep in Polyphemus’ flock so that he cannot feel them escaping. Recognising that he has lost his captives, Polyphemus calls out for help from the other Cyclops, telling them that ‘Nobody’ has hurt him. The other Cyclops therefore do not come to his aid. As Ulysses and his crew sail off into the dawn, they deride the blind Polyphemus. The giant prays to his father, Poseidon (Neptune), for revenge, and throws huge rocks towards the fleeing ships. Joseph Mallord William Turner (1775–1851), Ulysses Deriding Polyphemus (1829), oil on canvas, 132.7 × 203 cm, The National Gallery, London. Wikimedia Commons. 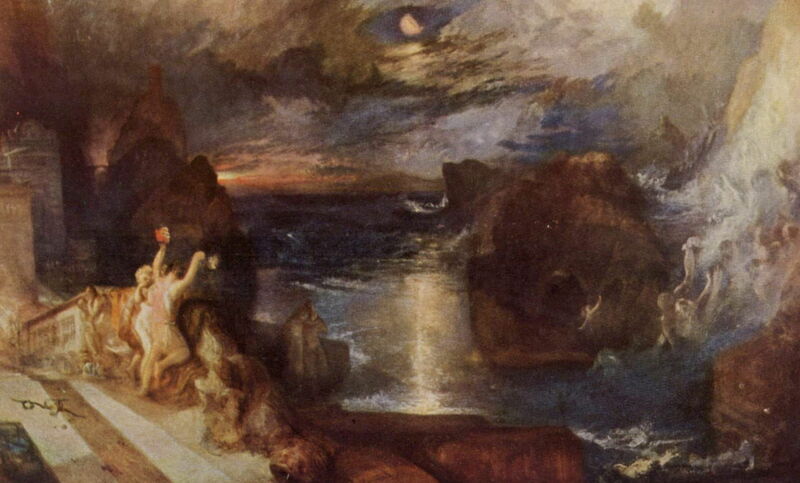 Turner’s depiction is quite faithful to the narrative of the Odyssey, although it is hard to discern the distant form of Polyphemus, shown high on the top of the cliffs towards the left. He shows the entire crew, led by Ulysses brandishing two large flags, arrayed up the masts and rigging to deride the blinded giant (here at the top left). The orange flag on the mainmast bears the Greek letters Οὖτις (Outis, meaning nobody, or in Latin Nemo), the name that Ulysses told Polyphemus was his. It is unclear what the ghostly white figures in front of the bows of the ship are intended to represent. Turner had worked on rough sketches for this painting as early as 1807, if that sketchbook has been accurately dated, and the finished painting was exhibited in the Royal Academy show of 1829. Another classical legend, this time recorded in Greek by Musaeus, tells of the hapless romance of Leander (man) and Hero (woman). She was a priestess of Aphrodite, living in a temple at Sestos on the European side of the Hellespont (now the Dardanelles in Turkey). He lived in Abydos on the opposite side of the strait, now in Asia Minor. Leander fell in love with Hero, and each night through the summer and autumn swam across the dangerous waters to be with her, consummating their relationship. To guide him across, Hero lit a torch at the top of her tower. Joseph Mallord William Turner (1775–1851), The Parting of Hero and Leander (1837), oil on canvas, 146 × 236 cm, Tate Britain, London. Wikimedia Commons. Turner’s painting again adheres quite faithfully to the traditional narrative, although something of a composite containing elements of both the precursor to the climax, and the climax itself. Hero’s temple at Sestos is on the left, with a couple of towers visible on the coast, neither of which contains a light. Leander is seen swimming across the narrow straight (its width shown far smaller than in reality), from right to left, to join Hero. Behind him on the bank at Abydos are spirits emerging, indicating Leander’s imminent death. Joseph Mallord William Turner (1775–1851), The Parting of Hero and Leander (detail) (1837), oil on canvas, 146 × 236 cm, Tate Britain, London. Wikimedia Commons. Hero, though, is shown holding up a lantern, which does not appear in the original written account. 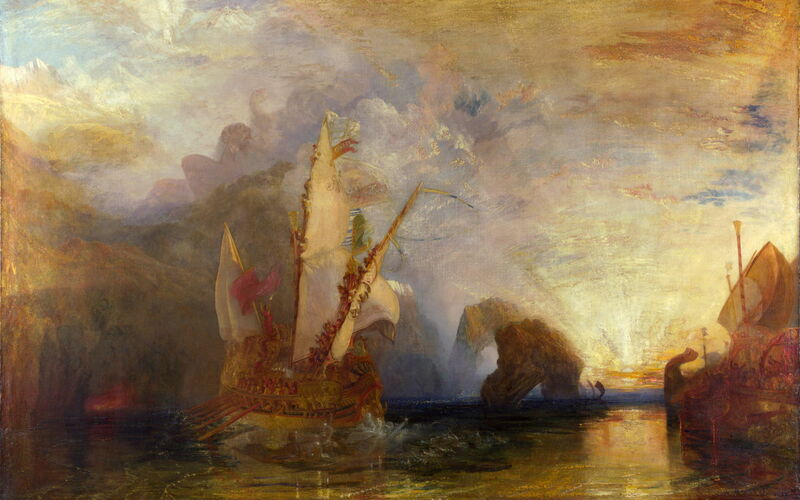 However it is more likely that Turner’s painting was based on Lord Byron, who swam the Hellespont himself in May 1810, and described it in his Written After Swimming From Sestos To Abydos. 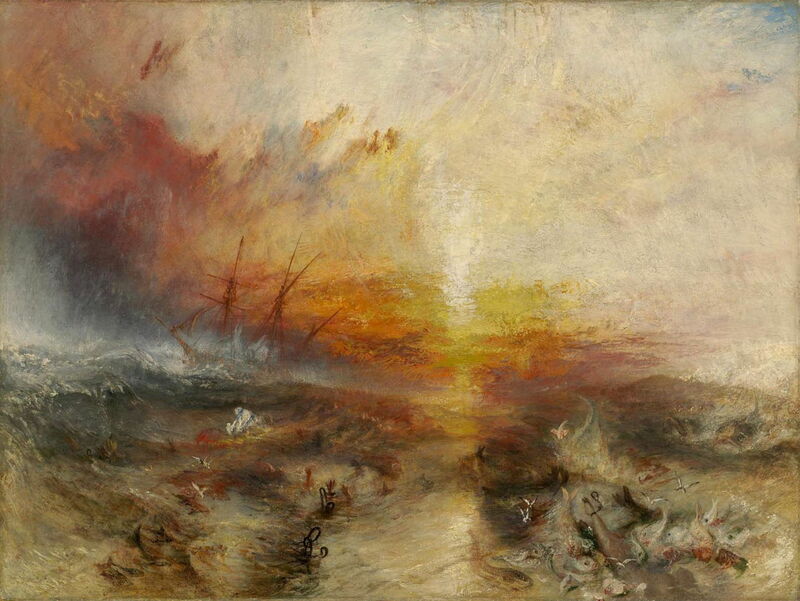 Turner was more than capable of telling his own narratives in paintings, of which the best example is this famous depiction of the vile and inhumane aspects of the slave trade. Inevitably there are several different accounts of the background to this painting. What is clear is that it was not uncommon practice for slaves being shipped from Africa to the Americas to be thrown overboard, for various reasons. One captain, of the ship Zong, wrote an account of doing this in 1781, when a tropical storm was blowing up. Recognising the potential loss of value in his human cargo, he threw the sick and the dying overboard, because he could claim only for slaves ‘lost at sea’, as they were during the storm. Joseph Mallord William Turner (1775–1851), Slave Ship (Slavers Throwing Overboard the Dead and Dying, Typhoon Coming On) (1840), oil on canvas, 90.8 × 122.6 cm, Museum of Fine Arts, Boston, MA. Photo by Museum of Fine Arts, Boston, via Wikimedia Commons. Turner shows a threatening sky and a violent sea, with the ship in the middle distance, silhouetted against the blood-red sky. The foreground is filled with the ghastly evidence of the slaves who were cast overboard. Joseph Mallord William Turner (1775–1851), Slave Ship (Slavers Throwing Overboard the Dead and Dying, Typhoon Coming On) (detail) (1840), oil on canvas, 90.8 × 122.6 cm, Museum of Fine Arts, Boston, MA. Photo by Museum of Fine Arts, Boston, via Wikimedia Commons. Seen in amongst a feeding frenzy of fish and scavenging seabirds are hands raised from the waves in their final plea for rescue, a gruesome manacled leg, and various shackles used to restrain the slaves when in transit. Further back on the left a vague white form could represent spirits, and on the right is the thrashing tail of a sea monster. Turner’s approach to sea creatures was romantic rather than scientific. It has also been claimed to have been an important part of the campaign against slavery, although the Slavery Abolition Act had become law in 1833, allowing only very limited exceptions, which were eliminated in 1843. As Blayney Brown establishes, Turner continued to paint histories, with their narratives, even late in his career, when his approach to painting had become quite radical, attracting fierce criticism. Turner apparently saw no contradiction in using avant garde methods for very traditional genres. Blayney Brown D, Concannon A and Smiles S eds (2014) The EY Exhibition: Late Turner – Painting Set Free, Tate Publishing. ISBN 978 1 84976 145 1. Shanes E (1990) Turner’s Human Landscape, William Heinemann. ISBN 0 434 69502 5. Mr Turner (2014), biopic directed by Mike Leigh, at Wikipedia. Movie review: Mr. Turner (2014). Posted in General, Painting and tagged Leander, narrative, Odyssey, painting, slavery, Turner. Bookmark the permalink.